I am finally back into a “normal” routine: I woke up this morning, poured myself a cup of good, hot, strong coffee, logged onto blogger and began leisurely reading the new posts. AH…I have missed this simple pleasure of life (although I am not sure which I missed more — reading the blogs or having a cup of good coffee vs the hot brown water I have been drinking at school). I have enjoyed reading all the July ’09 wrap up posts and I wish I had more to post myself. I spent most of the month writing papers for my two classes. In the Shakespeare class I had to write a movie review of one particular scene in the Michael Hoffman 1999 film adaptation of A Midsummer Night’s Dream (I chose the scene when Bottom is first introduced to the audience); I had to write a prompt AND response for an in-class writing assignment that I would give to my students (stage the first 73 lines of A Midsummer Night’s Dream), and I had to write a unit plan for teaching A Midsummer Night’s Dream to my 8th graders this academic year (I will teach the play over the entire year, with a final performance for the student body on May 7, 2010). That basically sums up the work for one class. The Rewriting a Life class was less structured, but more intense. We had to keep a writer’s notebook in which we were encouraged to write every day: either observations made; notes from other books; ideas for writing projects; reactions to life; etc. We had to write three separate pieces in three weeks (this would usually include several drafts), then we had to revise two of the these three pieces in the final three weeks. Each piece had to include a “cover” sheet where we had to detail why we wrote what we wrote – and why we made each change to the piece before turning it in (the professor actually read ALL drafts of every project we turned in. She was amazing). I am sure I wrote well over 100 pages (double spaced) for this class alone. While I thoroughly loved this class and hope to continue the writing discipline, I must confess that I have not done any writing since classes ended. Perhaps I will begin this new regimen this coming week. I have only read three books this month (aside from the required reading for school) and all three are non-fiction writing books: Poemcrazy by Susan Wooldridge, Bird by Bird by Ann LaMott, and Write to Learn by Donald M. Murray. We had to read another book by Murray for class and I really enjoy his encouraging, easy-going writing style. 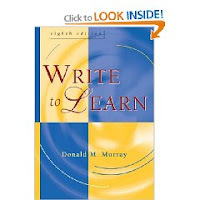 This book has helped me to focus on the various ways to experiment with all phases of writing. For example, he describes 9 or 10 different ways to outline! Since I have difficulty thinking outside the box, this has been helpful for me. I also think I can use some of his practical suggestions in class this year when I try to implement creative writing in the 9th grade English class. Bird by Bird is a classic, and I can understand why. While her language is a bit off-color at times, she has a wonderful sense of humor and basically says “just write” She talks of having a one inch picture frame next to her computer and when she feels as though she has nothing to write, she just tells herself she only needs to write “one inch”: a character description; a setting; a small scene in the middle of a story — anything, just write. There is something very freeing in that image. This is a book that I am sure I read again and again, as there are such great nuggets of information tucked away on nearly every page. The final book, Poemcrazy, was the perfect book for me! This book is not as much about writing poems (something in which I feel totally inept) as it is a book filled with exercises to help your imagination and creativity bloom. The author has the same easy-going writing style as the previous authors (hmm…..maybe there is a pattern here: are all authors encouraging of one another and want all to experience the same euphoria of writing for the sake of writing?!) and I read her book in about two days time. Now I need to go back and really DO the exercises. The most memorable idea that I recall is the concept of writing from your “shadow” person. Apparently this is a term used by Carl Jung, but can easily be used as a writing tool. The concept is this: by the time we reach the age of seven we have learned what others consider “acceptable” behavior from us, and what they consider “unacceptable” Our shadow person is all that “unacceptable” behavior that has been squelched all these years. Usually our shadow person is the opposite of our public personality. So, for example, if you are normally a shy, quiet, timid person your shadow would be outgoing and boisterous. The exercise is to write from the voice of your “shadow” —- cool idea, right? Much to my surprise (and somewhat shame) I have not picked up a book to read since I returned home on Thursday night. Now, I could use the excuse that I have been busy unpacking and reconnecting with family – but that would not be completely true. I have had ample time to read something. I have spent some time in the “nook” making room on the bookshelves for BEA books and library sale books (they were left in boxes and bags when I left home in June) and I have daydreamed about which books to begin. I could read a classic for the Everything Austen challenge; I could read a fantasy for the Harry Potter challenge; I could read A Year in Provence to complete my own Summer Vacation challenge; I could read Gunpowder Green for the Cozy Mystery challenge; I could read any number of books that I simply could not resist because of your amazing reviews (off the top of my head I can easily come up 25 or 30 titles) — and yet I simply cannot make up my mind. I sure hope this reading rut dissipates soon and I can once again be transported to fabulous literary worlds and then relive the adventures by writing the reviews. It sounds like you need a break after the intensity of your classes. Don't push it – you'll be hungering for a good book soon. Glad you're back! Everyone gets in a reading rut once in a while! You'll be back before you know it! I agree with Kathy: I think you need a break. You'll soon be back into reading for fun. I'm with everyone else. The intensity of your classes is probably not something you can simply bounce back from. After you enjoy a break, I imagine you'll be itching to read a good book for pleasure soon. And if I haven't already said this (but I think I have), welcome back!! I can't imagine how you feel like blogging/writing after having so much writing to do for school. How do you do it? You have been busy. I enjoyed reading about your writer's notebook. I have always wanted to keep a journal. I have always failed to continue. I just loved "Bird by Bird." So practical but fun to read. And I say just close your eyes, pick a book and then just read it…one inch at a time. I am sure you will get back into your reading when the times comes. You probably just need a little break. Have a great week, Molly! Bird By Bird is a wonderful book. It doesn't sound like you're in a reading rut at all. Molly I hope you get some much needed rest. That book Write to Learn sounds very interesting. Will have to check into that one. Your reviews are great on your books you read. Might check into the poem book also. I like the sounds of the three books on writing you mentioned. I'm going to check them out. I'm sorry about your reading rut. May I suggest watching a movie that's been made from a book? That happened to me last year and I watched The Secret Life of Bees (made from a book I loved) and it snapped me back into my love of reading. Worked for me. On the other hand, you may just be brain dead from such an intense school program. You may need some rest and a chance to immerse yourself in something different. Your creativity is still there. It'll come back. I loved A Year in Provence! It may just offer you that break you desperately need now, too. I love Bird by Bird! And Poemcrazy was such a wonderful book, too. I'll have to give the Donald Murray book a try. I get into reading ruts too, especially after coming back from a long trip. Don't worry, you'll be reading lots again in no time!